Victoria’s Gera Chandler is never far from west coast water. She’s been incorporating her beach finds into baskets that sometimes include polymer. 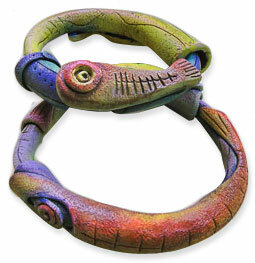 Her latest fetish is fish and the most recent version of Gera’s FuSion Bangles shows them in her signature colors swimming around wrists. Catch up with Gera’s baskets on her Flickr site and on Facebook. Gera’s work is featured in the upcoming book, Polymer Clay Global Perspectives which is available for pre-order (hint, hint). Great stuff Gera! You are always full of surprises but your work is always intrinsically yours an there is no mistaking it. Primitive in a funky fun crazy cool way. Colors just blend together perrrrfectly! Fabulous art to be sure! Thanks for featuring my Fishy Fusions Cynthia and thanks to everyone for the encouraging comments here and in FIickr! It was really UPlifting to go online after a wifi free few days at an inspiring Workshop and discover that I was on PCD! What a way to start a week!